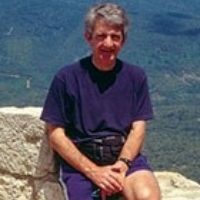 A guidebook to walking the Cathar Way, a waymarked trail through France's southwest, linking historic castles associated with the ill-fated 13th-century Cathar heresy. 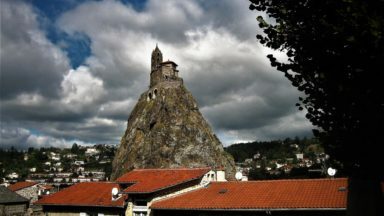 This 250km (2-week) route runs through the foothills of the Pyrenees in the Languedoc region of southern France, from the Mediterranean to Foix. Beautiful and historic area. Ideal Easter to early autumn, but can be hot in some areas from early June to mid-September. Port-la-Nouvelle and Foix (end-points). Acces via Toulouse, Montpellier, Nîmes, Perpignan, Barcelona, Girona, Carcassonne. Hillwalking but not an arduous mountain trek (highest altitude 1300m). Can be walked by anyone who is well equipped and moderately fit. 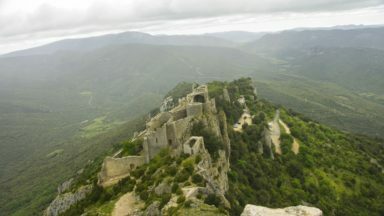 Cathar castles of Quéribus, Peyrepertuse and Montségur. The Cathar Way - the Sentier Cathare - is a popular, well-waymarked trail which links several of the world-famous 'Cathar castles' of south-west France. A challenging, fascinating and rewarding route, it is not an arduous mountain trek. The trail runs for about 250 kilometres – from the Mediterranean coast westward to the historic town of Foix. It can be walked in two weeks or less by anyone who is well-equipped and moderately fit. Good-quality accommodation is available at regular intervals along the entire length of the trail. The trail traverses the dramatic foothills of the Pyrenees mountains, a beautiful countryside which enjoys plenty of sunshine and is rich in wildlife. 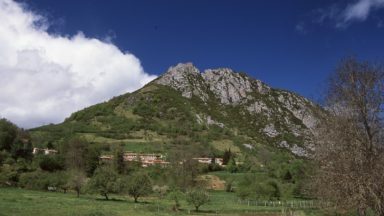 The highlights of the Cathar Way are the 'castles in the sky' like Quéribus, Peyrepertuse and Montségur. These incredible medieval fortifications will forever be associated with the ill-fated Cathar 'heresy', which was brutally suppressed in the thirteenth century. The sketch maps in this book offer only an indication of the key features along the trail, and it is strongly recommended that those who tackle the Sentier Cathare (or who walk anywhere in the Cathar region) also equip themselves with the relevant 1:25,000 maps published by the Institut Géographique National (IGN). These excellent maps contain very detailed topographical information. The Sentier Cathare is shown on these maps, and although the route has been altered in a few places since the maps were published, overall this concerns only a relatively small proportion of the whole, and diversions are always clearly waymarked on the ground. All the 1:25,000 maps that cover the route of the Sentier Cathare show long-distance paths, local walking routes and a lot of other information of value to tourists, and all are into at least their second edition. You can tell which edition a particular copy of a map is by looking at the number in brackets in the title of map on the spine of the map cover. For example, the second edition of the Quillan map (dated 2000) has on the cover spine '2347 OT Quillan (2)'. If you buy maps in shops in France, check that you get the latest edition – copies of older editions may still be mixed up with copies of newer editions on the shops' shelves. The newer editions of all 1:25,000 maps are being marketed as Cartes de Randonnée (walkers' maps). A grid of numbered kilometre squares covers the 1:25,000 maps for the Sentier Cathare, and they can be used with global positioning devices (a GPS symbol is shown on the front of these maps). Many newsagents, bookshops and supermarkets in France sell IGN maps, but prices vary from shop to shop. A 1:25,000 map costs around €10 (about £7). The publisher Rando éditions has produced a series of 1:50,000 maps covering the French Pyrenees and their northern foothills. They are also called Cartes de randonnées, and they use IGN cartography. In this series, Number 9, Montségur, covers an area between Quillan and Foix, and thus includes the western half of the Sentier Cathare. Its price is around €10. For route planning purposes, IGN's series of 1:100,000 maps (the Cartes topographiques Top 100 series, or Cartes de promenade) is very helpful. Numbers 71 (St-Gaudens /Andorre) and 72 (Béziers Perpignan) cover most of Cathar castle country, including the whole route of the Sentier Cathare. IGN's 1:250,000 maps (their Cartes régionales series) are designed for route planning by road. Cathar castle country is covered by Midi-Pyrénées (R16) and Languedoc-Roussillon (R17). In France, the 1:100,000 and 1:250,000 maps currently cost around €5 each. IGN's website is at www.ign.fr, and is in French only. Their maps and other products can be bought via that website, but with postage to Britain and the cost of currency transfer, the final prices seem to be a little higher than those charged by British suppliers of the same maps. Stanfords, 12–14 Long Acre, Covent Garden, London WC2E 9LP, te1 020 7836 1321, sales@stanfords.co.uk, www.stanfords.co.uk. The Map Shop, 15 High Street, Upton-upon-Severn, Worcs WR8 OHJ, te1 01684 593146 (Freephone 0800 085 4080), themapshop@btinternet.com, www.themapshop.co.uk. On page 80, there is a reference to "a path (which) goes off to the left" (at the Col de Lenti). At the time of our book's publication, that path was not the official route. However, it is now - and it is waymarked as such. So that path should now be followed. It soon meets a track which can be followed all the way to Prugnanes, at the end of Stage 4. The former official route - as described on page 80 - can still be used, and it affords some fine views. But it involves some unnecessary ascent. The footbridge over the River Agly near the Galamus Gorge at "Tirounère" has not yet been replaced. It won’t be replaced until after the summer of 2017, and, even then, no precise date has been set. So the advice given in the update note of July 2015 still applies. Nevertheless, St Paul de Fenouillet (on the diversion route) is worth a visit. There is also plenty of accommodation in the town and it’s a good place to stock up. So it’s not a wasted journey to go through there. Stage 3 3rd paragraph (page 66, first paragraph )- The trail once again goes straight ahead, across the ravine. It is no longer necessary to follow the diversion around the head of the ravine. Stage 3 (page 68, fifth paragraph) ("A little further on...") - the trail now follows a short, obvious cut-off path, so you no longer have to follow the "U-shaped route" around the spur. Stage 5 (page 88) - Prugnanes to Caudiès-de-Fenouillèdes. There has been a substantial and somewhat bizarre change to the official route of the Sentier Cathare in this sector. The new route takes you over some beautiful countryside, but it adds considerably to the distance walked. Nevertheless, if you want to follow the new line of the official trail, its route is essentially as follows. From Prugnanes you retrace your footsteps and follow the trail to the east for about a kilometre. Then turn left and follow the trail as it climbs to the north. The trail passes by the Pla de Lagal, then bears to the west to cross the hilltop called Roc Paradet. It then heads north and takes you to Campeau, which is where you briefly meet the 'North Variant' of the Cathar Way. You then follow the trail to the south, along what is described in our guidebook (pages 102 to 104) as the 'Link from North Variant to Main Route'. This eventually brings you to Caudiès-de-Fenouillèdes. This change, together with the long, 'temporary' diversion from the Gorges de Galamus south to Saint-Paul-de-Fenouillet then north to the Col de Lenti (see Update Note, May 2016), makes the route(s) of the Sentier Cathare on Stages 4 and 5 (between the Pla de Brezou and Bugarach (to the north) and Caudiès (to the south), pretty complicated. Stage 6 page 115, third paragraph - A short route through the hamlet of Le Bézu now cuts off the loop in the tarmac road. Our Update Note of December 2014 referred to a 'temporary' winter closure of the Sentier Cathare through the Gorges de la Frau, on Stage 10 of the trail. This winter closure has now been made permanent. The path through the gorge will be closed every winter between December 15 and March 15. 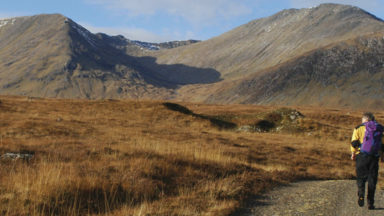 An alternative, waymarked route begins at the Refuge des Gardes (point 5 on Stage 9, page 143) and descends to Pelail (point 4 on Stage 10, page 150). Following this diversion cuts out a considerable length of the trail. It effectively means that Stages 9 and 10 become one stage, with the start at Espezel and the terminus at Montségur. The diversion is a long descent, quite steep and potentially slippery in places. Take care if following it. An Update Note of January 2012 ('page 39 - Maps') referred to a 1:55,000 map called 'Le Sentier Cathare' which was published in 2011 by rando éditions. This map was also referred to on page 188 of our guidebook 'The Cathar Way'. An updated version of this map appeared earlier this year (2016). This is the 'Le Sentier Cathare' Hiking Map (Collection 'Cartographie Pyrénées', number 09), 1:50,000, published by rando éditions (using IGN data). Although the scale is said on the cover to have changed slightly, this is not apparent on inspecting the new map. However, the map is still extremely useful, especially as it shows recent modifications to the route of the Cathar Way (see Update Note elsewhere), plus details of connecting paths and nearby circular walks. The 2011 edition of this guidebook was referred to on page 188 of our publication 'The Cathar Way'. A new version of this French guidebook appeared earlier this year (2016). This new version takes account of recent modifications route of the Cathar Way (see Update Note elsewhere). A fire between Tuchan and Padern is reported to have burnt over ten square kilometres of vineyards, woodland and hill scrub land on September 5th and 6th 2016. The fire was said to have been extinguished by September 7th, but it will undoubtedly have affected land crossed by Stage 3 of the Cathar Way. This may lead to temporary diversions or closures of parts of the trail in this sector. The major works which were started last year in the Galamus Gorge, to stabilise the cliff face and to prevent further falls of rock (see Update, May 2015 below) took longer than expected, but have now been finished. The road through the gorge is once again open to walkers (and to motor traffic). However, the footbridge over the River Agly just below the gorge, at a place called "la TirounËre"(referred to as point (6) on pages 76 and 79 of our "Cathar Way" guidebook), is still missing (see Update, July 2015(1) below). There seems to be no indication of when the footbridge will be replaced. It is possible to ford the river on foot at this point during dry periods (there are calm sections of water which are about ankle-deep). But, to repeat the warning given earlier, on no account should you try to ford the river at this point (or anywhere else) during or just after periods of heavy rain. The river can rise very quickly and become very dangerous. The diversion of the route via St Paul de Fenouillet (see Update, July 2015(1) below) is still in place. The chambres d'hotes, MAISON 1800 in Lapradelle is closing indefinitely on October 1st 2015. A wooden footbridge over the River Agly near the Galamus Gorge, on stage 4 of the Cathar Way, has been washed away and probably won't be replaced until 2016. The footbridge, near a place called "la Tirounère", is referred to on page 79 of our "Cathar Way" guidebook. A long diversion via St Paul de Fenouillet has been waymarked. For walkers travelling between Duilhac-sous-Peyrepertuse and Prugnanes, this adds a good 10km to the distance to be covered in that day. To shorten this distance, follow instead the "bad weather route" mentioned at the top of page 76. That is, from point 3a on the Pla de Brézou, follow the GR36 down to the D7 road, at point 4. Turn left there and follow that road down to St Paul de Fenouillet. To return to the Cathar Way from there, see the second paragraph on page 79 and the sketch map on page 76. Some walkers are sticking to the route of the Cathar Way at la Tirounère by fording the river on foot. That may well be quite feasible in hot, dry periods during the summer. But on no account should you try to ford the river at this point (or anywhere else) during or just after periods of heavy rain. The river can rise very quickly and become very dangerous. The first link is to a downloadable pdf file of the "Carnet de Voyage" of the trail. 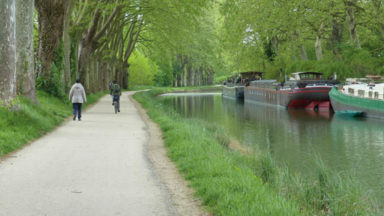 This contains what is probably the most up-to-date list of shops, restaurants and accommodation establishments in towns and villages along the trail. The second link (or rather pair of links) is for the GPS tracks for both the official main route ("Trace GR 367"), and its southern variant ("Trace GR 367-a (variante sud)"). In May, June and September 2015 (and possibly in subsequent months), major works are scheduled in the Galamus Gorge, to stabilise the cliff face and to prevent further falls of rock. This means that the narrow road through the gorge, which is followed by the Main Route of the Cathar Way (now also known as the GR367A), will be closed at various times during these months. It is not clear whether this will mean that pedestrian access through the gorge will be closed, but it would be wise to act on this assumption. This means that, during these months, walkers on the Cathar Way who plan to follow the Main Route should follow the bad-weather alternative, along the GR36, from the Pla de Brézou to the D7 road, then along that road to rejoin the Main Route near the southern entrance to the gorge. With reference to the map on page 76 of the guidebook, this means following the route from point 3a to point 4, then to point 5. It appears that the works will not affect the North Variant of the Cathar Way (now also known as the GR367). This has now happened. The Sentier Cathare is now officially the GR367. The GR367 takes in the North Variant via Bugarach and Quillan. What is referred to in our guidebook as the ‘Main Route’ (via Puylaurens) (and which is also known as the ‘South Variant’) has been designated the GR367A. In addition, the whole of the route now carries red and white waymarks, and new signposts (see an example at www.alanmattingly.eu/GR367A-signpost.pdf). The distinctive blue and yellow waymarks which formerly designated much of the route of the Sentier Cathare have been replaced. The closure period is 15 December 2014 to 15 March 2015. A map showing a temporary alternative route can be downloaded here: www.alanmattingly.eu/sentier_cathare_frau_2016.pdf. This alternative route begins near the Refuge des Gardes (point 5 on Stage 9) and descends to Pelail (point 4 on Stage 10). In Espezel (stage 8), the Hôtel Grau is now called "Le 100 Unique". In Comus (stage 9), there is a new chambre d'hôte, recommended by a reader, 'L'Oustal d'Annetta'. Address: Lieu-dit, 128 devant ville, La Thémis, 11340 Comus . Tel: + 33(0) 468 748 126; + 33(0) 622 452 537. E-mail: ghislaine.caria@loustaldelannetta.fr. The Mas Occitan no longer excists and also the restaurant Le Viaduc has disappeared. There is another restaurant, but it is not open everyday. The B&B , maison1800 has a tiny shop in the village which is only open in the morning ( bread needs to be ordered a day before ). In the season the castle is now lit between 22.00 and 24.00 hours. Significant amendments to the route of the trail have been made recently in Stages 1 and 4. A few relatively minor amendments have been made elsewhere. Policy on waymarking is also evolving. The accommodation section (Appendix 1) has been re-written. Useful new publications in French have recently appeared. These developments are described below. The Sentier Cathare is still well waymarked throughout its length, but the system of waymarking is evolving, and is likely to change further in the years ahead. Where the trail coincides with a national GR path, its route is indicated by the red and white waymarks of such paths. This applies to certain sections on Stages 4 and 5 (GR36); to a section on Stage 7 (the GR7); and to the whole of Stages 10, 11 and 12 (GR107), nearly all in Ariège. In due course, the Sentier Cathare may itself be designated as a GR path. In that case, the whole of its route will be indicated by red and white waymarks. But, for the moment, the first nine stages of the trail are mostly indicated by blue and yellow (supposedly ochre) waymarks. Where the trail coincides with a GR path, the blue and yellow waymarks sometimes still appear along with the GR path's red and white waymarks. But it is to be expected that this will be the case less and less in the future. On one short section of Stage 5 (Main Route), the trail is indicated by red and yellow waymarks, where the Sentier Cathare coincides with a regional path, the Tour du Fenouillèdes. The sketch maps in this book offer only an indication of the key features along the trail. It is strongly recommended that you also equip yourself with a very useful 1:55,000 map called Le Sentier Cathare, published in 2011 by rando édition. It covers the whole trail. Further information on the map is given here: www.editions-sudouest.com. Go straight ahead at a crossing of tracks by the wind turbines (5) and start to descend. After a short distance, take a left fork (ie, go straight ahead). Red and yellow waymarks indicate a right turn here, but that is for a different route, so ignore those waymarks. Stay with the blue and yellow waymarks of the Sentier Cathare. You are descending in the direction of another group of wind turbines. Pass a ruined building, come to a fork and go right there. After nearly a kilometre, a track joins on the left. You are very close to one of the wind turbines, on the left. Here, the trail chinks slightly to the right then continues in the same direction. Not very long after that, look out carefully for a T-junction of tracks and turn right there. The trail bears round to the right, seemingly turning back on itself. The edge of the plateau, on the left, is approached. You reach the top of a steep slope with cliffs to the right and left (6). Directly below on the left is a stony path going down between the cliffs. Scramble down that path. The path leads to the edge of a vineyard. Continue downhill, in the same direction. On meeting a track at the bottom of the vineyard, turn left, along that track. This track leads you to a narrow tunnel under the N9 road (7). This handy guide has clear instructions for the stages of the trail along with points of interest, maps and an accommodation listing. 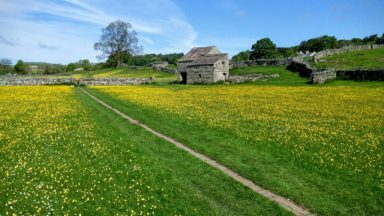 In keeping with Cicerone's walking series, the guide is well laid out with colour photographs and an easily digestible insight into the history of the area. Indispensible for walkers visiting the area. Rating 9/10.